On a Friday night in March, a full house in the Kimball Theater listened in rapt attention as Ursula Burns shared stories from her storied career, rising through the ranks at Xerox from intern to engineer to CEO — the first African-American woman CEO of a Fortune 500 company. Burns now chairs VEON’s supervisory board and is a director on the boards of American Express, ExxonMobil, Nestlé and Datto. She regularly appears on lists of the world’s most powerful women. But she spoke to the audience in a comfortable and frank way, assessing her challenges and successes honestly and with humor. 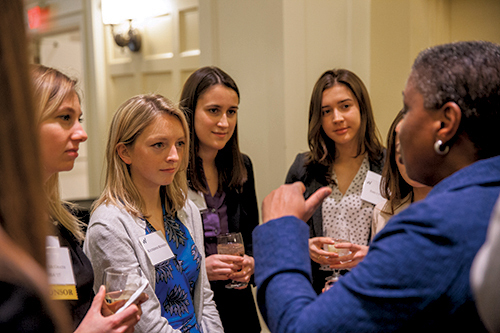 Making connections: Students networked with business leaders during the summit. Todd Boehly ’96, chairman and CEO of Eldridge Industries and sponsor of the Women’s Leadership Summit, moderated the discussion, which was followed by a question-and-answer session with the audience. Topics included work-life balance, mentorship, making tough decisions and being a woman of color in the technology field. She advised the audience not to compromise a good life for more money. Ultimately, what matters is that you leave behind more in the world than you take away. 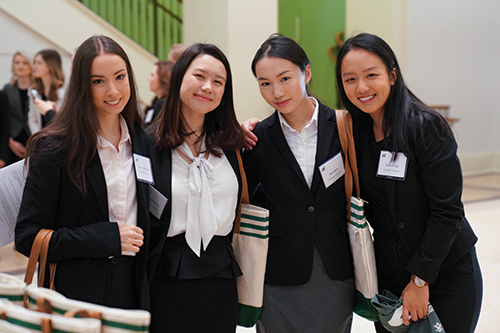 The next morning, excitement filled Alan B. Miller Hall as more than 50 women from 16 top universities competed in the Raymond A. Mason School of Business’s third annual Women’s Stock Pitch. For the undergraduate women who came to compete, the event provided the hands-on experience that will help them launch a career in an industry that is typically dominated by men. Across the globe, women are slowly paving a path to parity in the finance industry as more and more women are standing out as leaders — and many are reaching out to help guide other women into the field. Events like the Women’s Stock Pitch help to bridge the divide. Each two- to four-person team took turns convincing a panel of three judges that their stock was a winner. The teams had 10 minutes to formally present and meticulously explain the dozens of charts and indices used to arrive at their recommendation. Then the floor was opened to 10 minutes of questions and feedback from the judges. The teams chose stocks from a wide array of industries ranging from health care and banking to pet insurance and cloud computing. Perfect Pitch: Student teams from around the world competed in the Women’s Stock Pitch competition. The University of Notre Dame, University of Texas at Austin, Brown University and the University of Sydney advanced to the finals. In the end, it was the University of Sydney’s Starbucks pitch that took home the top $2,500 award. Although only a few could walk away with a prize, everyone benefited from the event’s message of empowerment and support. Elizabeth Cabell Jennings ’85, P ’17, senior vice president & director of Institutional Investment at SunTrust, spoke during a lunch panel on the importance of inclusivity in the workplace. Her presentation showed that investors work best in groups, and groups with roughly equal numbers of men and women perform best overall. Still, only 16 percent of certified financial advisers are female. “The world of finance needs change, and you are the people who are going to do it,” she says. After lunch, participants attended two successive panel discussions: “Craftswomen of Communication” and “Agents of Positive Disruption.” In each, students separated into groups with different industry professionals and discussed topics relating to workplace communication and innovation through creative thinking. “In investments, there’s not a lot of women, so having that emphasis where it’s just women is amazing,” Draper said. She also participates in the university investments club, which features its own yearly stock-pitch competition. Among the nearly 40 members of that group, only three ar e female. North says that the panel discussions encouraged her to be confident when giving and getting criticism and to ask questions when starting at a new company. It reminded her that the company she works for will want her to be comfortable, and that she shouldn’t pretend to be anyone else. North remembered what Ursula Burns had said the night before about being a good leader and the importance of staying true to yourself.